Businesses face an unprecedented labour shortage. 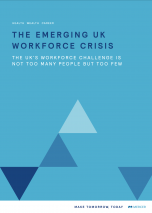 The impact of the UK’s ageing population on the UK economy and access to labour has been masked in recent years by positive net migration – until now. With immigration likely to fall, organisations must take the opportunity now to get ahead in order to ensure future growth and minimise risk. What are the forces shaping the future of work and careers? 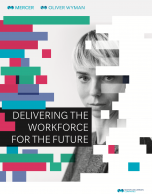 In this CRF report, we take a look at the trends shaping the future of work in 2018 - economic, demographic and technological changes influencing future talent needs today. Recommendations for HR professionals are also discussed. In this brief interview with Paul Schoemaker we discuss how businesses can better navigate the future in the current climate of uncertainty and constant change. Paul discusses scenario planning - a useful tool for navigating the future, and why uncertainty is here to stay. In this short video, we ask Adam Kingl, Regional Managing Director, Europe at Duke Corporate Education, for his opinion on the future of work and how the world of work will evolve in the future. The smartphone, a novelty a decade ago, is now in everyone’s pocket or handbag. What impact is this prevalence of technology having on us and our work lives? As organisations rethink their business models - redesigning work to harness the power of technology and adjust to a fast-changing world - it is clear they can't succeed without making people a priority. Digital technology is disrupting entire industries and changing the way companies do business across all stages of the value chain: how they develop, market, produce, sell, and deliver products and services. As companies change their business models, they are also challenged to think about their future workforce. Are you worried about potential disruptors within your business field and how they might affect the future of your organisation? Perhaps, you have identified some already and need effective strategies to prepare your business? Almost every industry is now a technology business. So how technology develops in the coming decades will have a profound effect on companies everywhere, in every sector.